We step inside the church to a grand space filled with beautiful art. 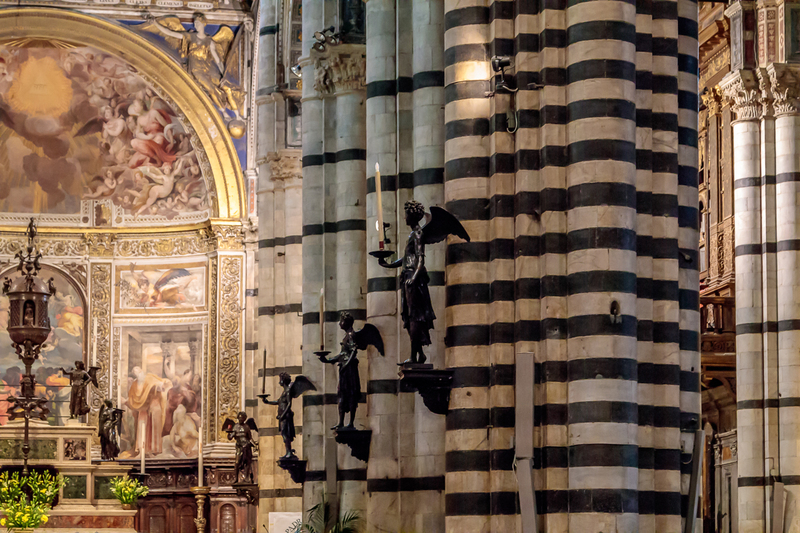 Again, the pillars are alternating bands of black and white marble. 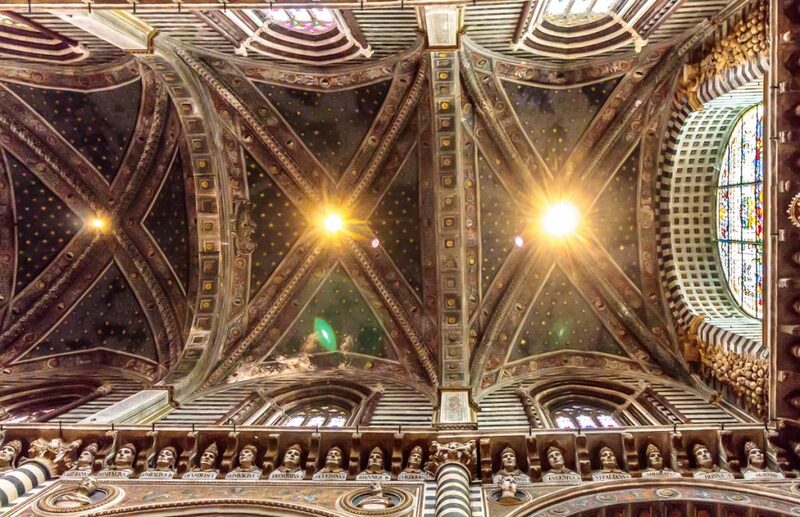 The ceiling is painted simply, but beautifully. 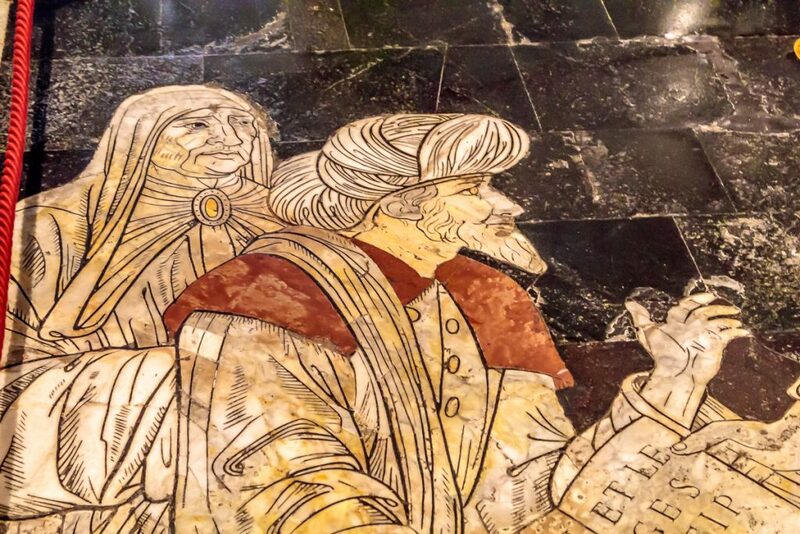 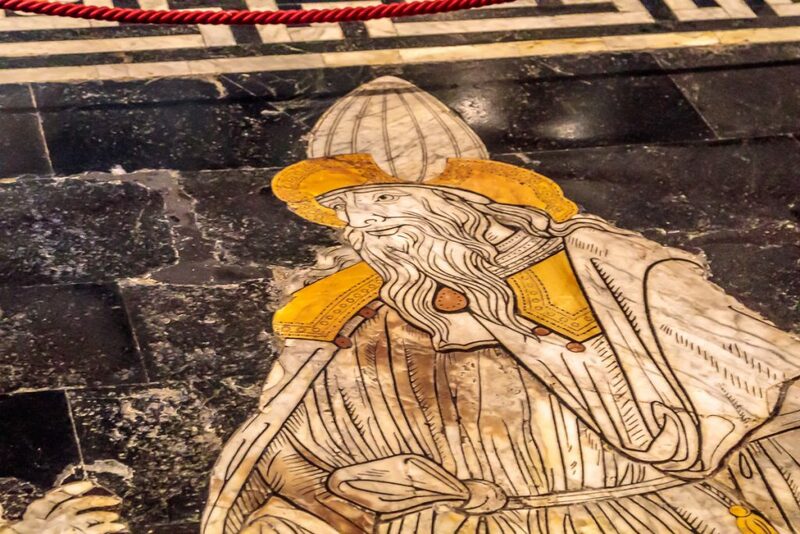 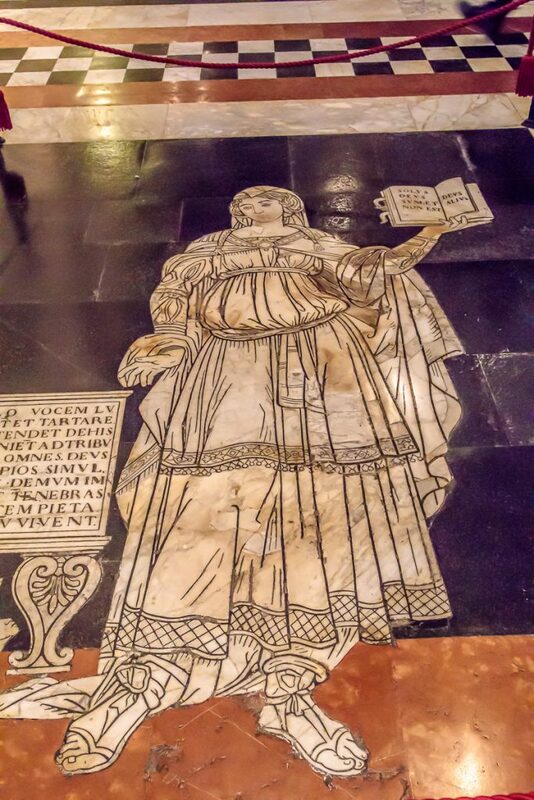 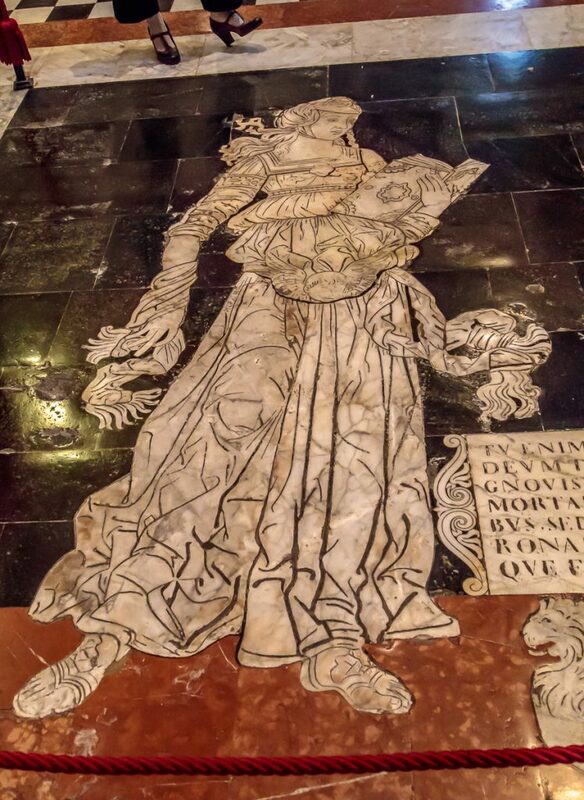 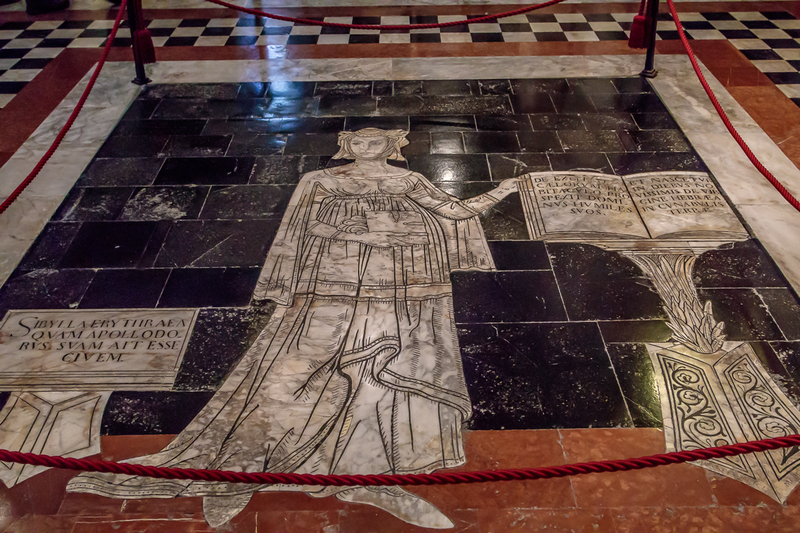 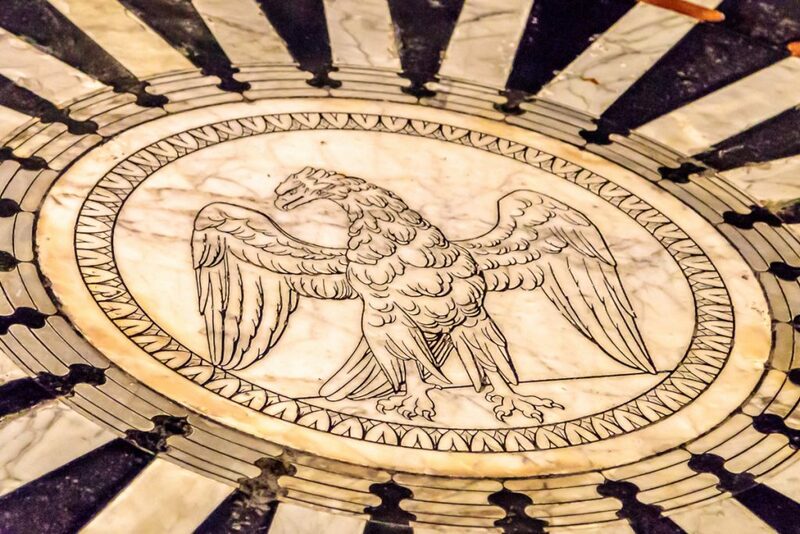 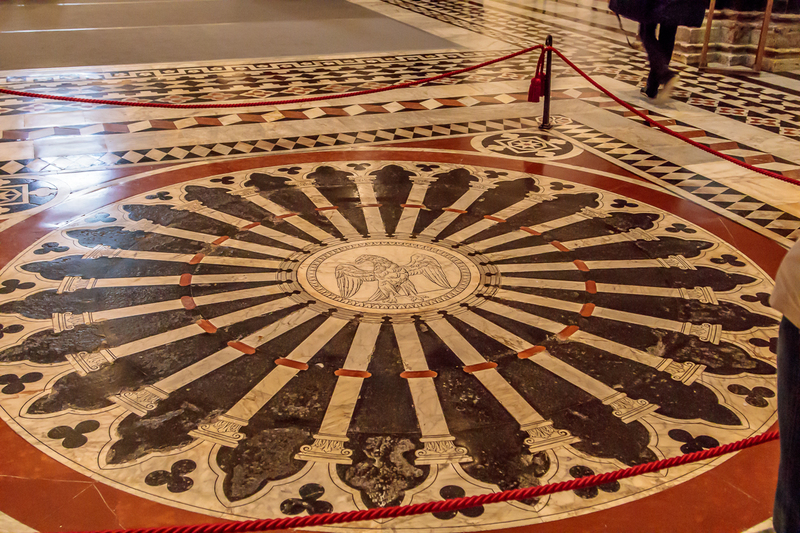 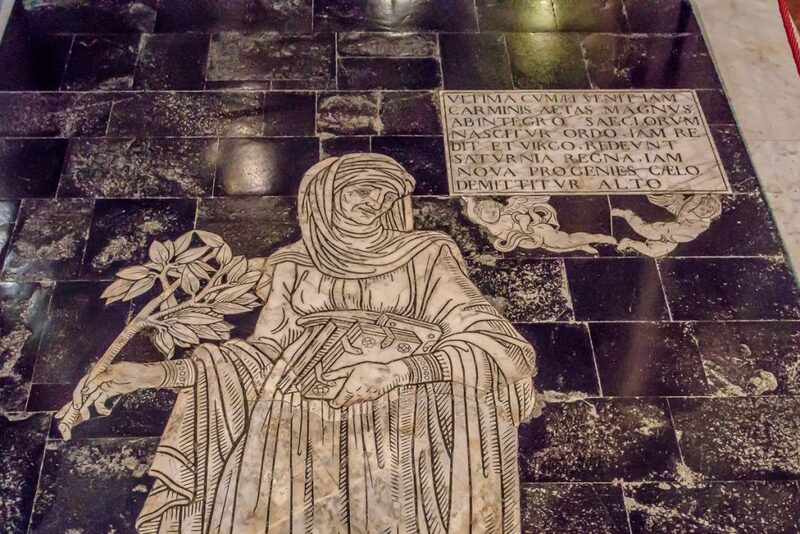 The inlaid marble mosaic floor is one of the most ornate of its kind in Italy, covering the whole floor of the cathedral. 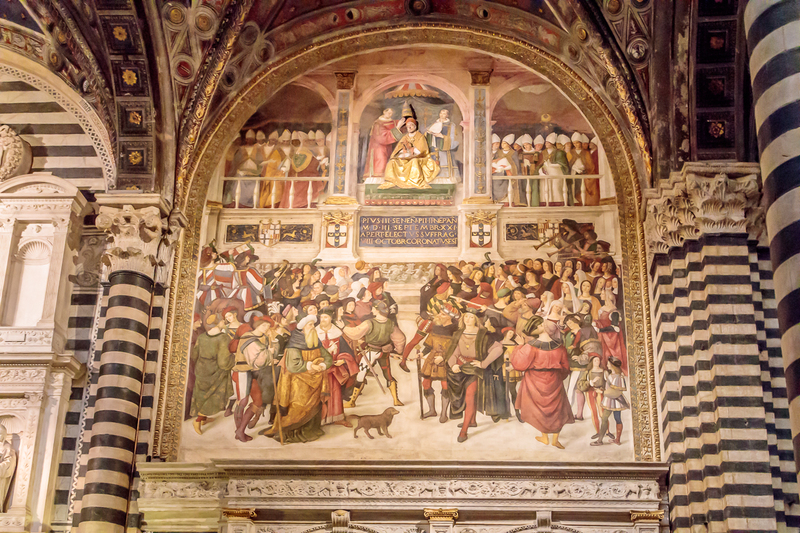 This undertaking went on from the 14th to the 16th centuries, and about forty artists made their contribution. 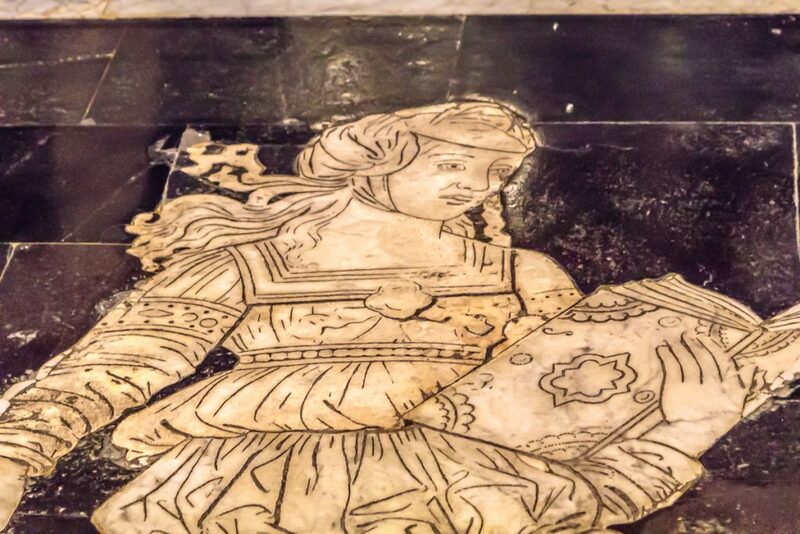 The floor consists of 56 panels in different sizes. 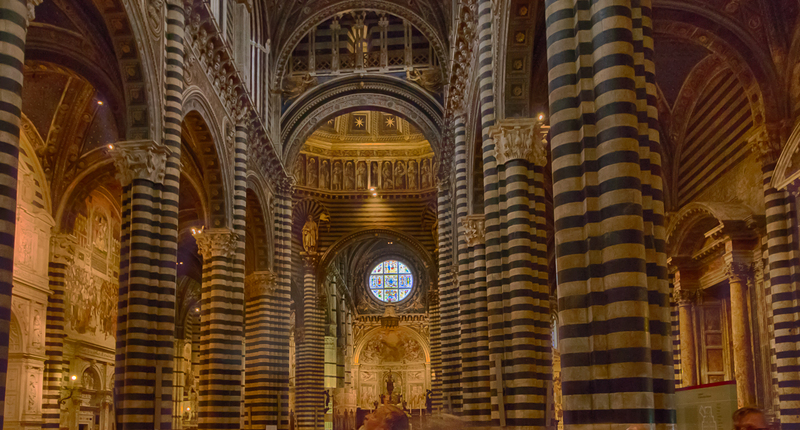 Most have a rectangular shape, but the later ones in the transept are hexagons or rhombuses. 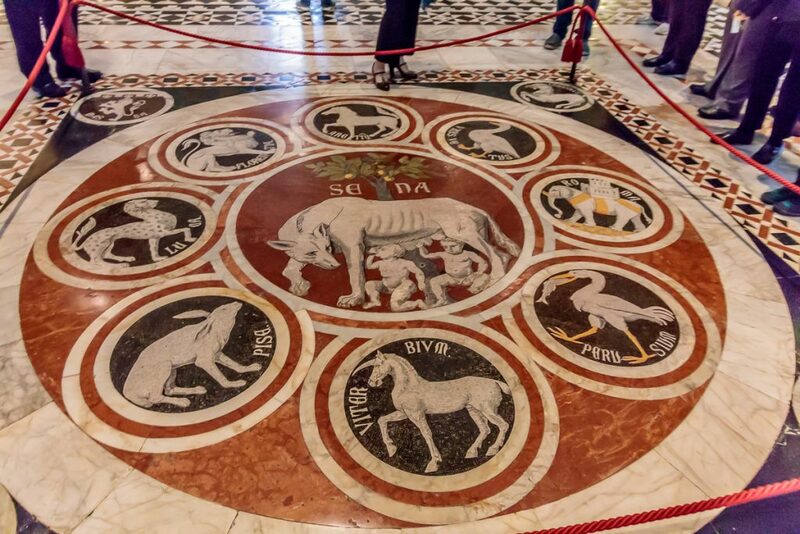 They represent the sibyls, scenes from the Old Testament, allegories and virtues. Most are still in their original state. 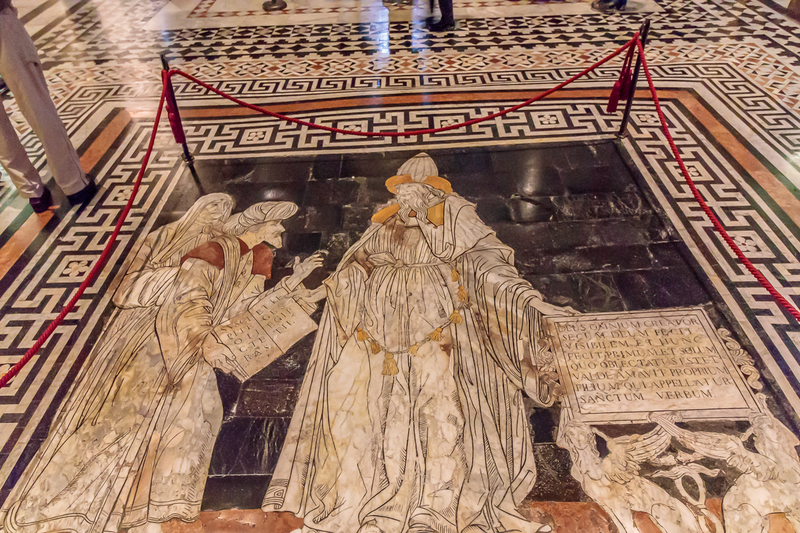 The earliest scenes were made by a graffito technique: drilling tiny holes and scratching lines in the marble and filling these with bitumen or mineral pitch. 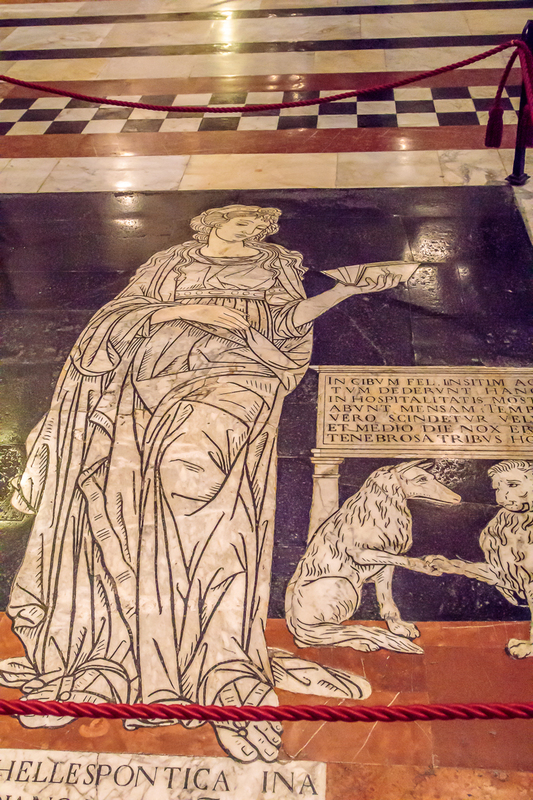 In a later stage black, white, green, red and blue marble intarsia were used. This technique of marble inlay also evolved during the years, finally resulting in a vigorous contrast of light and dark, giving it an almost modern, impressionistic composition. The earliest panel was probably the Wheel of Fortune (Ruota della Fortuna), laid in 1372 (restored in 1864). 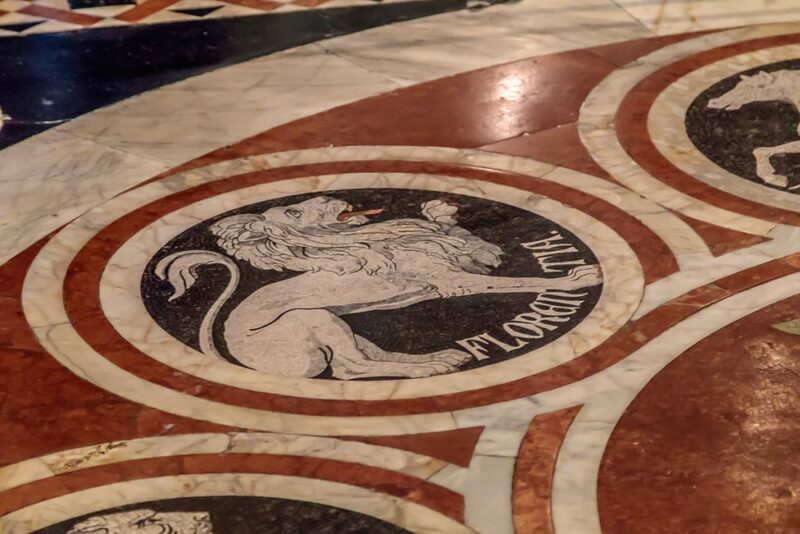 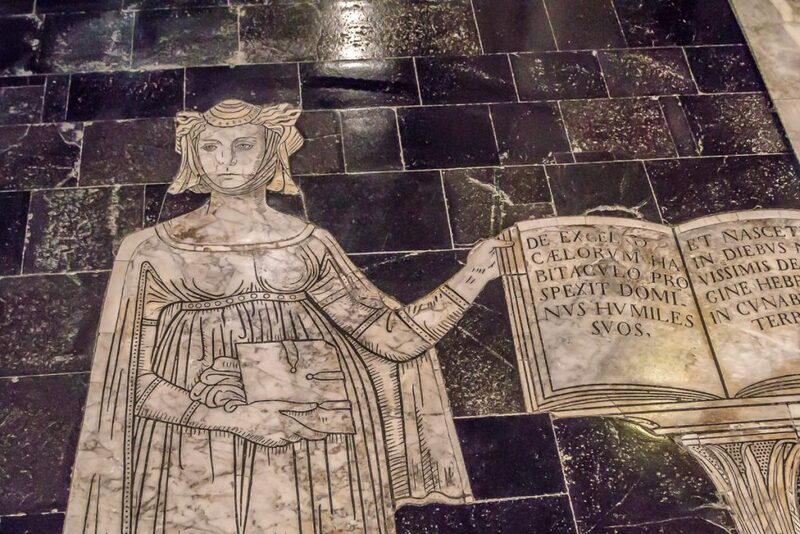 The She-Wolf of Siena with the emblems of the confederate cities (Lupa senese e simboli delle città alleate) probably dates from 1373 (also restored in 1864). 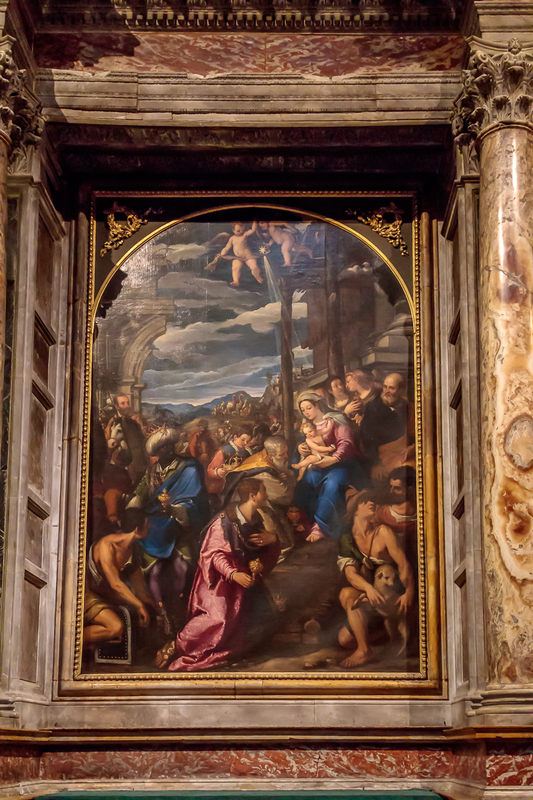 There is so much detail in each of these it is hard to consider the work involved to create each one, much less the entire collection. 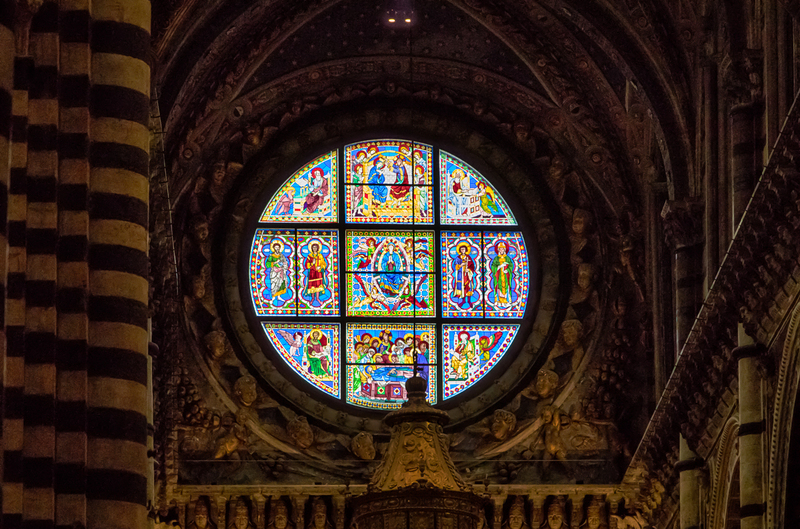 The stained-glass round window in the choir was made in 1288 to the designs of Duccio. It is one of the earliest remaining examples of Italian stained glass. 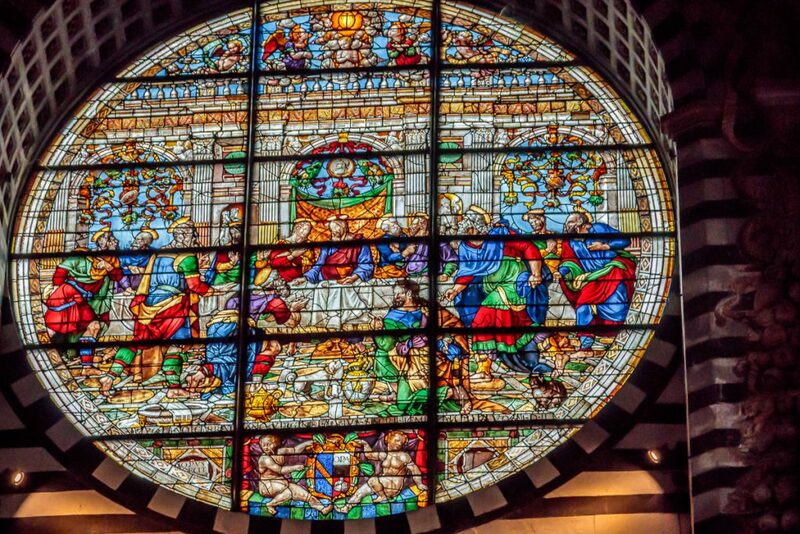 The round stained-glass window in the façade dates from 1549 and represents the Last Supper. It is the work of Pastorino de’ Pastorini. 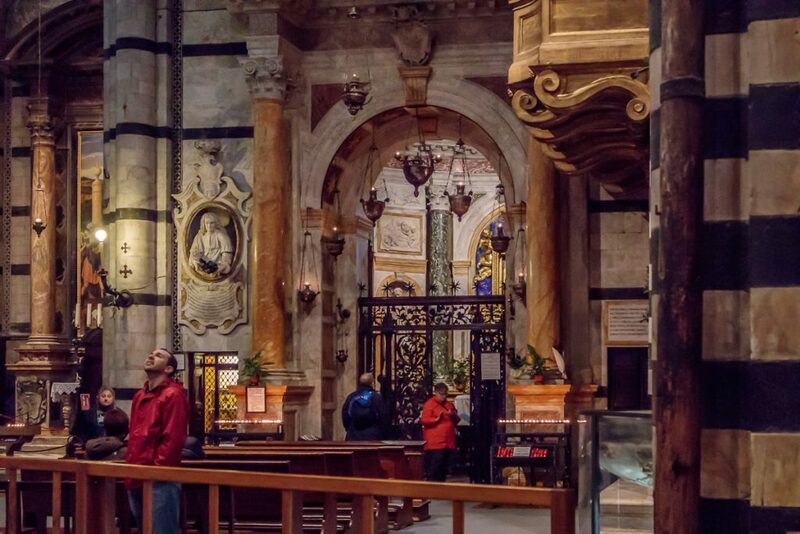 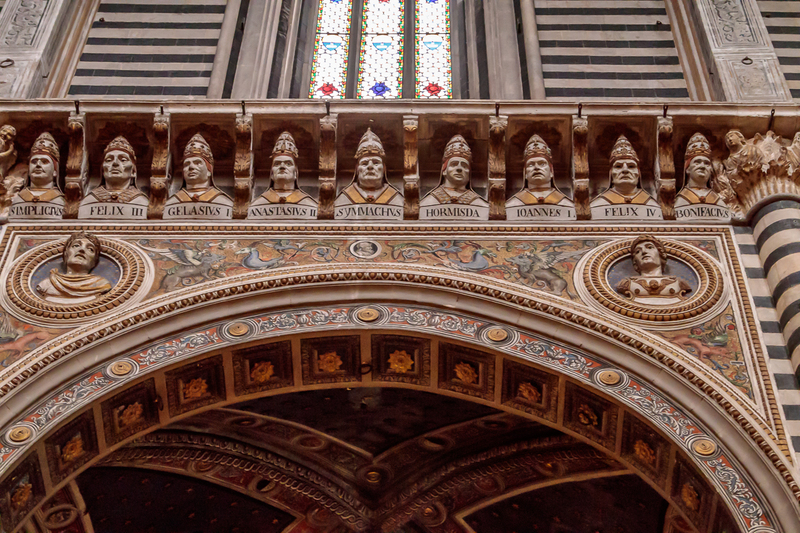 The horizontal molding around the nave and the presbytery contains 172 plaster busts of popes dating from the 15th and 16th centuries starting with St. Peter and ending with Lucius III. 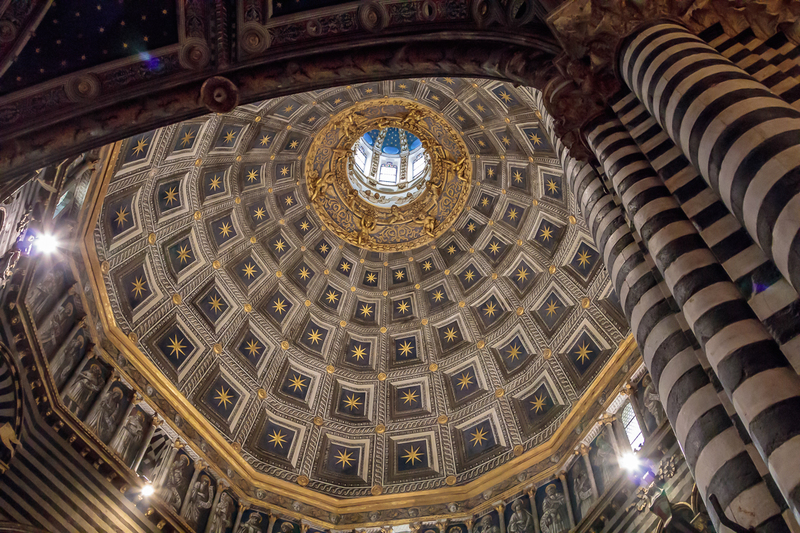 The hexagonal dome is topped with Bernini’s gilded lantern, like a golden sun. 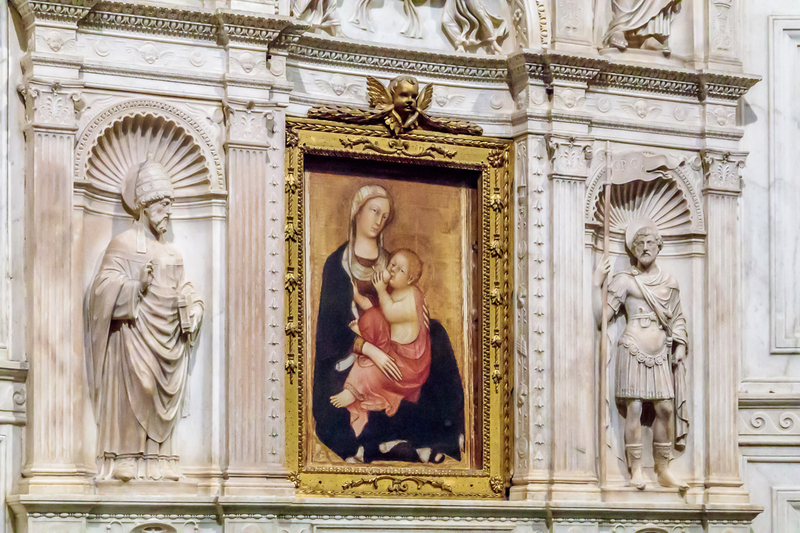 The trompe l’oeil coffers were painted in blue with golden stars in the late 15th century. 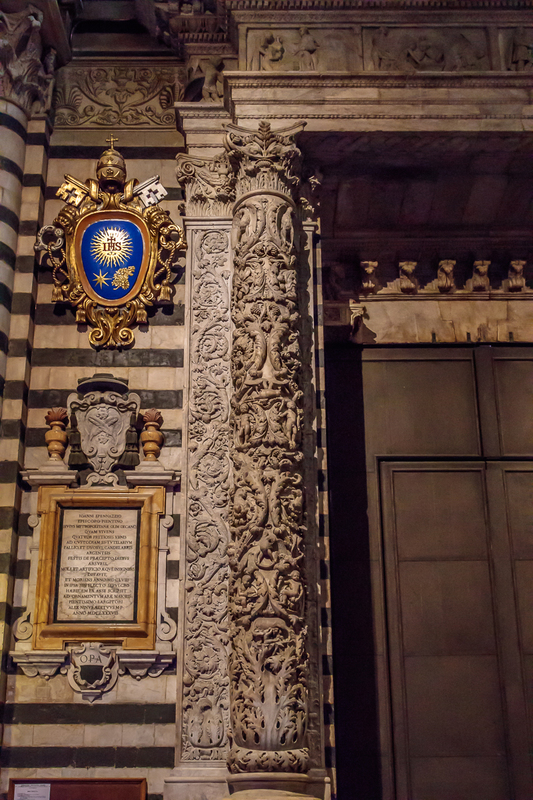 Against the pillars of the presbytery there are eight candelabras in the form of angels by Domenico Beccafumi(1548–1550). 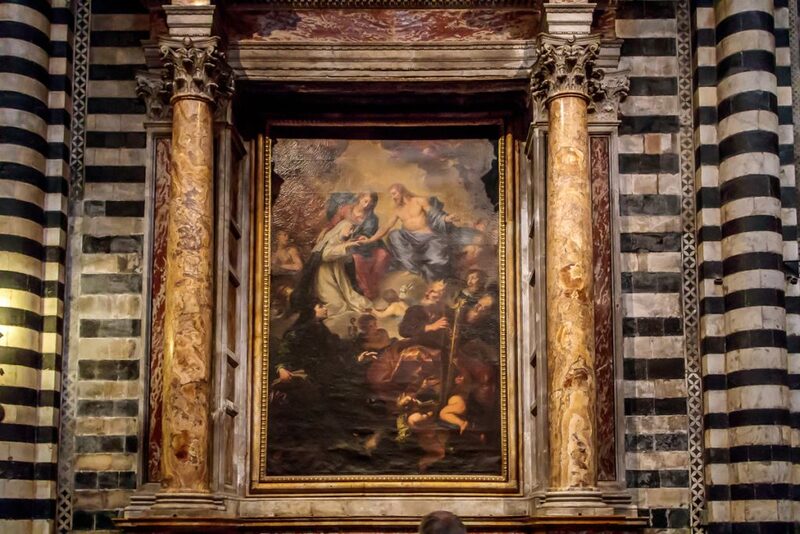 There are many other works of art, each of which deserves full description, but that would be an overwhelming task. 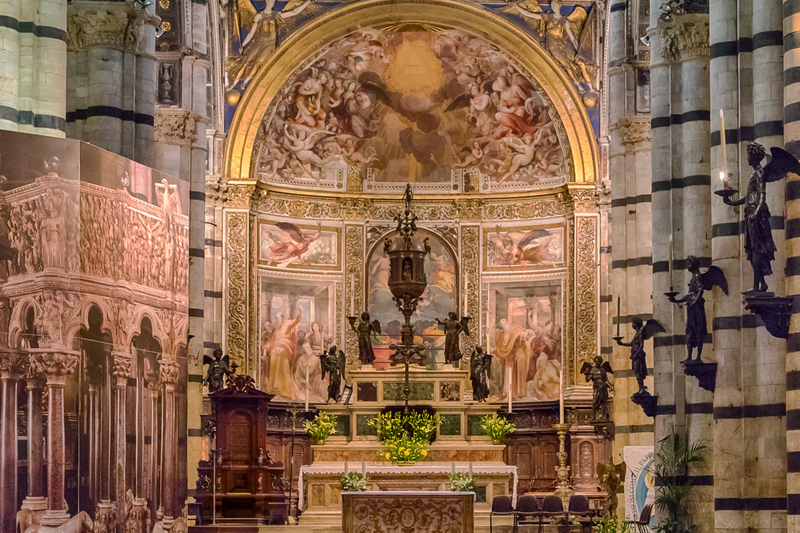 Just soak up the beauty and enjoy. So much to see, and so little time. Alas, we had to move on. 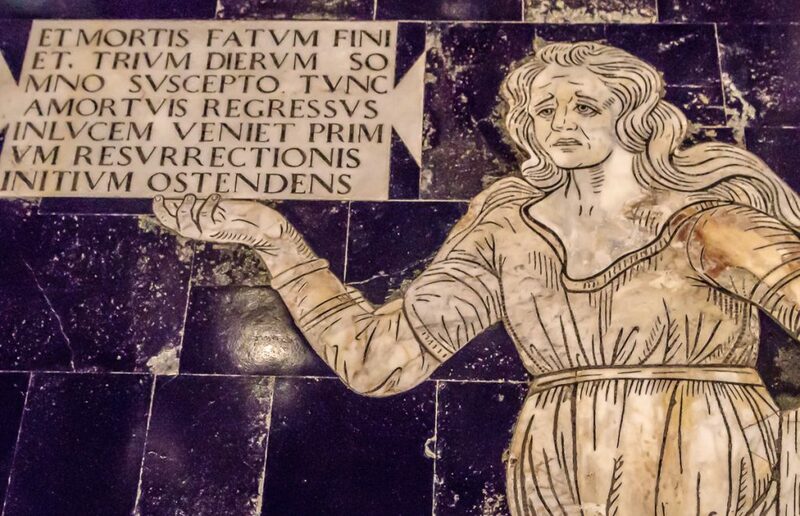 Again, the descriptions are from WikiPedia. 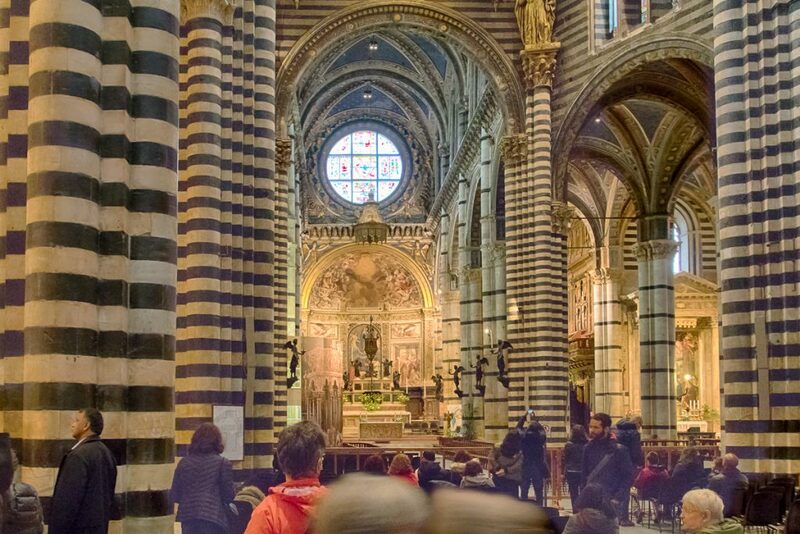 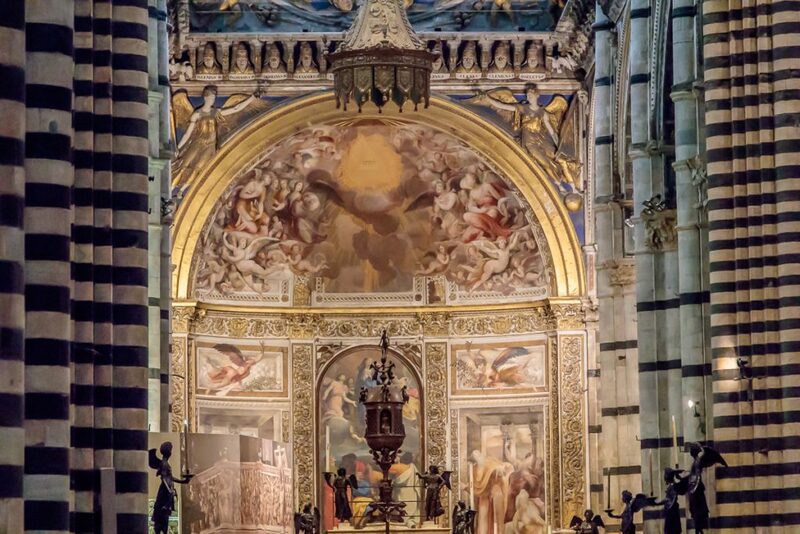 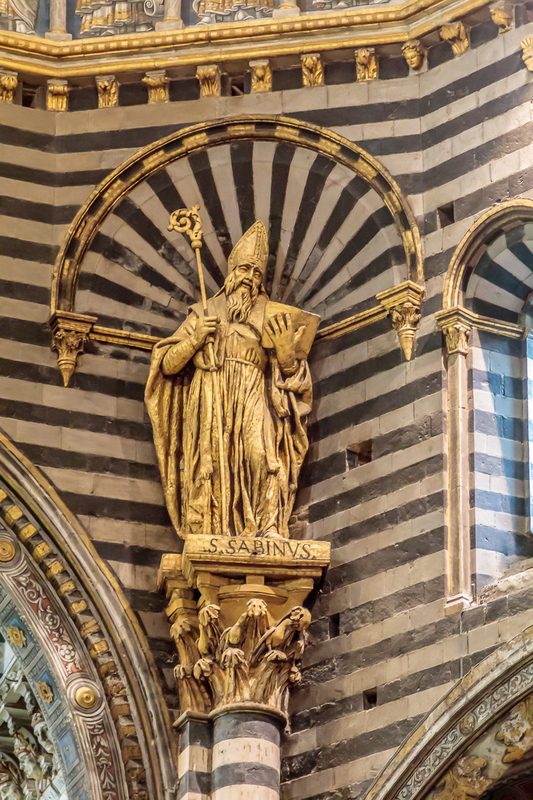 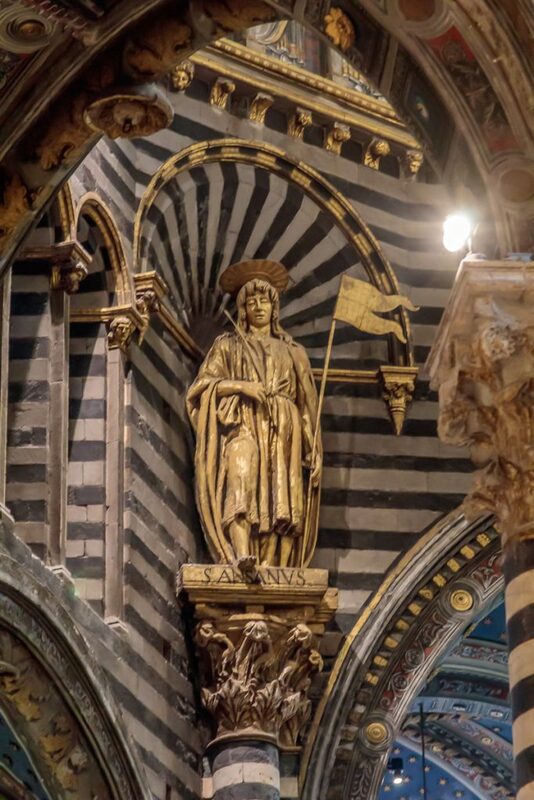 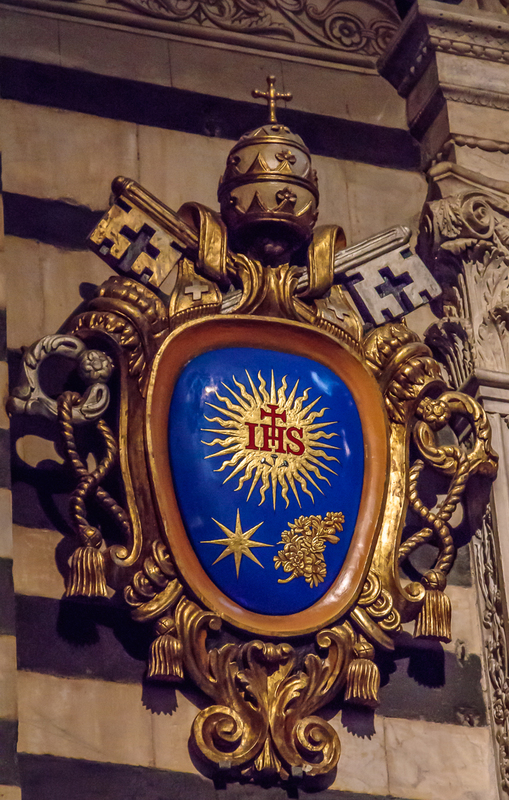 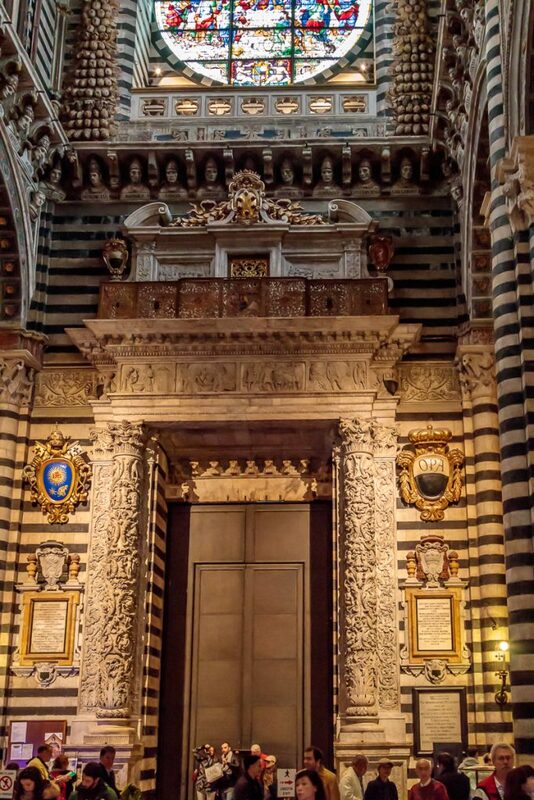 This entry was posted in Travel and tagged Duomo, Italy, Siena.